Coffee and chat with friends. What more could you want! The coffee is always on and the door is always open. We are a small friendly message board, with a little bit of this and that but not so much you are overwhelmed. So why not come and make a new friend today. P.S. Coffee is free! Spices Coffee Shop is a great place to relax and have fun with friends. I recommend you take a moment and visit them today! 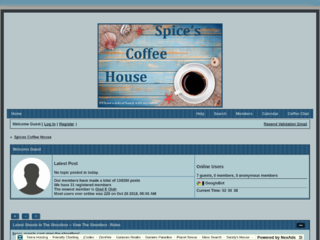 Click the rocket above to Boost Spice's Coffee House!